The Petzl Duo LED 14 Headlamp (E72 P) is a waterproof hybrid headlamp that boasts an extremely bright halogen bulb for long-distance focused lighting and 14 LED's for flood beam proximity lighting. 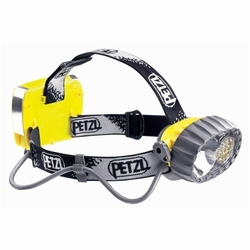 The Petzl Duo LED 14 Headlamp features regulated circuitry for constant level of lighting. It also switches to reserve power mode when batteries are weak.